On Thursday, April 26th, at 5PM, TAG will be welcoming Sarah Schoemann, one of the co-founders of the Different Games Collective, to speak at our lab. This event is free and open to the public. Whether you are a scholar or designer visiting as a part of the CHI 2018 conference, a local student, or just interested in the topic, come and join us for this special evening. Enabled by a the increased availability of free online tools, a flood of small, lo-fi games has emerged over the last half decade fueling new micro-cultures within independent games. Offering perspectives rarely seen in their mass media counterparts many of these “queer games”, “punk games” and “#altgames” share parallels with the handmade, self-published posters, zines and self-released records, that have circulated within leftist subcultures for decades. In keeping with these traditions, digital forms of cultural resistance have not only flowered online but in grassroots community spaces in urban hubs of North America, where pop up arcades, game exhibitions, and game jams are staged in DIY music venues, art galleries and game-community spaces as part of a milieu some have called the “new arcades”. As online harassment within games culture renders online spaces increasingly hostile towards marginalized identities, offline spaces have emerged in recent years as sources of social and material support for underrepresented players and makers. Following organizations like NYC’s Code Liberation Foundation, Toronto’s Dames Making Games and Montreal’s Pixelles, Different Games Collective (DGC), a grassroots organization supporting diversity in games, has engaged in a multi-year collaboration with Atlanta’s Charis Books & More, the US’ oldest remaining feminist bookstore. 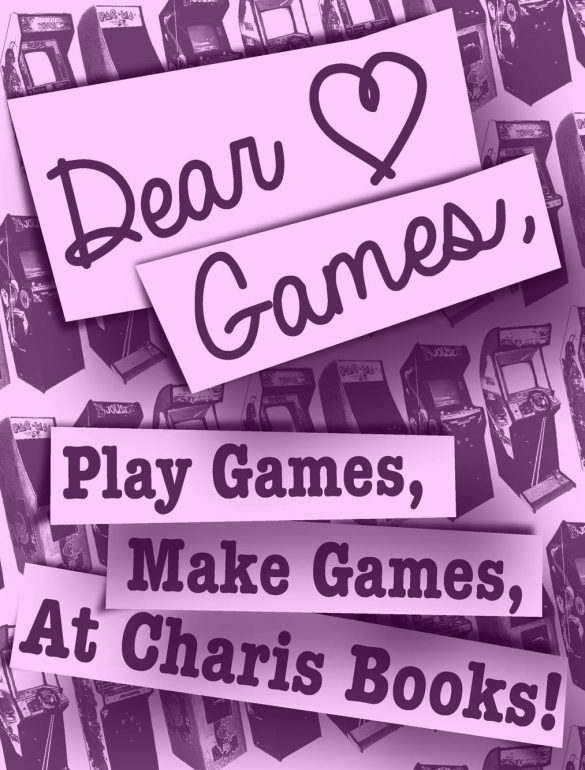 Together DGC and Charis have established “Dear Games”, a program of free public events on games and feminism, offering discussion groups, game-making workshops and author talks to local community members. The project aims to support the growth Atlanta’s games scene not only from within a feminist community space, but one rooted in the tradition of independent bookstores, infoshops and radical community spaces. Dear Games explores what it means to bring games into a diverse intergenerational dialogue, investigating what historical feminist communities can offer emerging generations of feminists and vice-versa. Looking back on the first two years of the project, GA Tech PhD student and researcher Sarah Schoemann will address the tensions and opportunities of exploring games culture while maintaining intersectional feminist, anti-racist and queer political commitments. Sarah Schoemann is a doctoral student in Digital Media at the Georgia Institute of Technology. A designer and researcher formerly of NYC’s indie games scene, she is the co-founder of Different Games Collective, producing inclusive events to support diverse participation in game development and culture since 2013. Working at the intersection of games and human computer interaction her research explores the practices of DIY communities and organizations in relation to broader conversations about equity and access in STEM fields.